IKA has located about 50 KM away from Tehran. There are 2 options available for getting from the airport to the city. Even though the metro line has been expanded to the airport, yet the taxis are the best options at the moment. Airport Metro working hours are from 5.30 AM-11 PM (not reliable yet). And there is a train every 70 minutes and it’s not a direct line. There are lots of ongoing changes in this line and service at the moment. Therefore, don’t risk it! Make sure you have the address you want to go in Farsi and also provide the driver a contact number of your hotel/hostel to call. Most of the drivers can’t read or communicate in English but they will rely on their experience in finding the way at the end! Always pay the fee at the end of your trip and not at the beginning. Well, like everywhere else! The other option which can buy you all these troubles at the start point of your trip, is to order a pickup service from your Hotel/Hostel. It might be a little bit more expensive. But having a driver waiting for you to drive you directly to your destination after a long flight makes it worth. There are no shuttle buses from the airport to the city so far. The other option as usual are taxis. Again make sure you will get an official yellow or green one to not end up in a fight with an unregistered taxi driver for the price. The fee of taxis can be quiet different regarding your destination. But since they are almost well organized you can trust the driver or the coordinator in the airport taxi station for the price they are declaring. 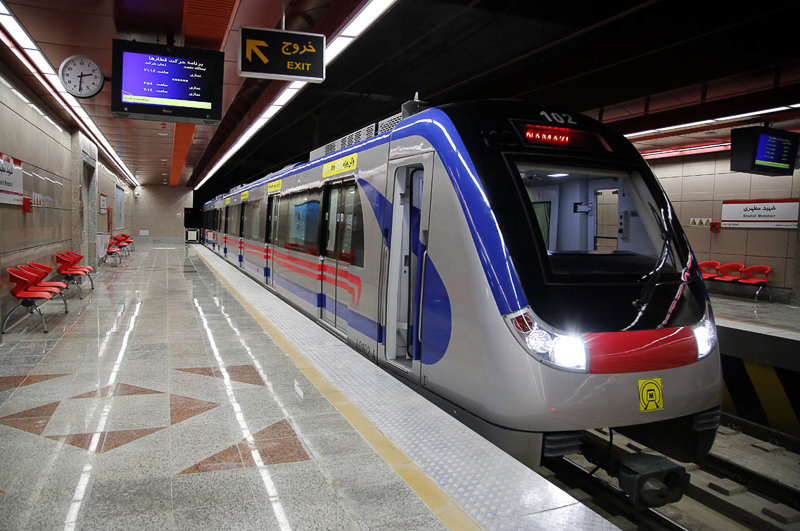 Tehran metro system is the fastest, easiest and the most efficient kind of transportation from every aspect in Tehran. To be able to escape the famous awful traffic of Tehran makes it OK to bare the pressure in the metro during rush hours. Fortunately, Tehran metro line is not one of the complicated ones and therefore, you will find it easy to use. Ask from people to inform you near your destination stop. They will help gladly. To be honest there’s no “Taxi system” in Tehran. Since there are many unofficial drivers, you don’t even need to find a taxi station. Standing beside the street will be equal to asking for a taxi! The point here is for you to know what kind of taxi you better to use and how. In general you can get 4 kinds of taxis in Iran or better say, Tehran: Getting a Darbast (private taxi) in the street, getting a normal shuttle or shared taxi in the street, Calling a taxi agency or using Snap( Iranian Uber). Getting a “Darbast” or private taxi in the street: As we mentioned before, to get this kind of taxi all you have to do is to wait beside the street or wave at a taxi. A taxi (most of the time an unofficial one), will stop soon enough. Again, we highly recommend you not to use unofficial ones. Also, there are many drivers who shout “Darbast” in the main squares or crossroads. Walk to them and ask for their service. 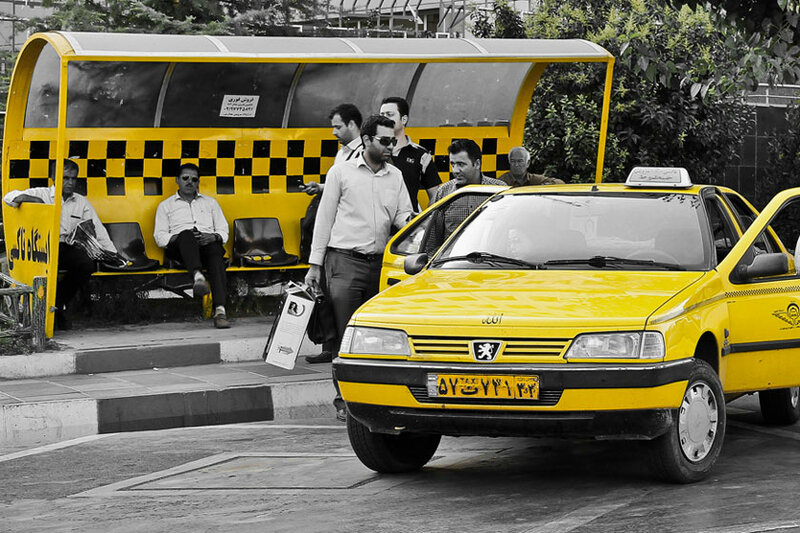 After finding your yellow or green taxi, show them your destination (try to have the address in Farsi), and negotiate the price. It’s very important to have an agreement on the final price BEFORE getting into the taxi. Don’t be surprise by the traffic, the way of driving and of course the drivers who almost never use a GPS. Getting a shuttle or shared taxi in the street: The most common kind of taxis in the street are the shared ones. They have a specific origin, destination and routes which has been decided by the transportation organization. The most important part here is to fine the ones which are the best for your destination. Usually there are big taxi stations in the main squares with different destinations. Just go to the taxi station coordinator or manager guy and show him your destination. Also you can ask people around or other drivers in the station to help you find the one you need. After that, you will go seat in the car and just wait for another 3 passengers to arrive and share the taxi with you. The price of the shuttle cars are usually reflected on a sticker on the taxi’s front window. Calling a taxi agency: The best scenario for using these kind of taxis are if you want to go from someone’s house somewhere and it’s already late night, or if you want to have a reliable way of going to airport on time at the end of your trip. The tricky part here is you have to ask your host or someone local to call the agency and arrange you the taxi which usually take between 5-10 minutes for them to arrive. The prices are almost fixed and it’s better to ask about it when calling the agency. That’s it! Using Snapp( Iranian Uber): The Iranian version of Uber has been launched since 2014 and it works pretty well. It’s also very cheap and most importantly easy to use. You can download the Snapp app for IOS and Android Create your profile (you need an Iranian SIM card to sign up!) and the rest is just like the Uber. The app is available in English, but the tricky part here can be the drivers who can’t speak English. Usually they will make a phone call before they arrive to ask about the exact spot you are waiting for the car. The easiest solution for this issue, is to pass your phone to a local person beside you to guide the driver. Fortunately for you, most of the people in Iran are ready for help tourist even more than they should! In addition to Tehran, the Snapp is also available in Esfahan, Shiraz, Tabriz and Mashhad and many other cities. Please read Snapp Post for complete list of cities with Snapp. The other options and companies which provide this service just like as the Snapp, are Carpino (you can download the IOS & Android app here) and also Tap30 (you can download the IOS & Android app here). But the best one is the Snapp at the moment.